Unofficial 'ramblings' from the desk of Peter Thwaites, Managing Director & Co-founder, e-Path Pty Ltd.
Industry giant and world leading SSL certificate authority THAWTE Inc. has made e-Path the topic of a recent case study promoting their premium SSL with Extended Validation (EV) webserver certificate product. THAWTE Inc. is one of the world's best known SSL certificate providers. They have an impeccable reputation within the banking, financial and international stock and money trading sectors. Perhaps as to be expected THAWTE SSL certificates are amongst the most expensive products of their type, however, the THAWTE SSL + EV certificates perfectly compliment the level of security the e-Path system has been engineered to deliver. When you see a website protected by a THAWTE SSL+EV certificate you can be assured the site owner is about as serious as they can possibly be about online security. Another completely off topic post to break up the monotony. 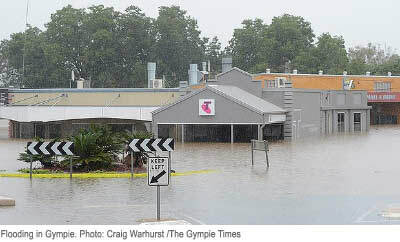 The township proper of Gympie has had it tough in recent times having been flooded three times in the space of a five week period. Most businesses in the township have been out of action for extended periods which puts great financial pressure on those who are trying to make a living not to mention also negatively impacts on the whole local economy. When it came time for e-Path Pty Ltd to acquire a new company vehicle we decided to give the local Gympie Ford dealer, Action Auto Group, a shot rather than source from Brisbane. e-Path has an office located in quiet Cooloola Cove so Gympie is not too far away anyway. 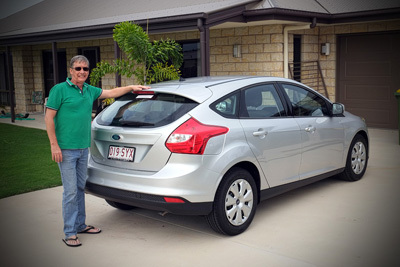 On Saturday April 6, 2013 our accounts manager Chris put his weekend on hold and popped up from Brisbane to take delivery of a freshly arrived brand new Ford Focus Ambiente hatch. Conrad and Teegan hand over the keys to Chris. What made this a little unusual, which is the reason why I'm rambling on about it here, is the level of friendly professionalism afforded to us by Conrad, Trevor, Peter and Teegan and how we are impressed with the Ford Focus itself. It was a choice between the Ford Focus, the Hyundai i30 or the Holden Cruise, no doubt all nice cars, but as Chris will now tell you he is very pleased we chose the Ford. Ford have some attractive drive-away pricing on most of their models at the moment so our timing could not have been better. It was nice to see this included a full year's rego and not just six months. Chris commutes from our main Brisbane office to the Cooloola Cove office fortnightly and so the idea we will no longer be paying hefty big car fuel prices is something that can't happen soon enough. And on that subject, what is it with fuel prices anyway? When the AUD was low against the USD, that was the reason why we were paying ridiculously high prices for fuel. But now the AUD is very high against the USD, apparently that is the reason why we are paying ridiculously high prices for fuel. Hmmm, I think it's fair to say we all know something is not right there. Anyway, the Ford Focus hatch is a particularly smart looking vehicle, extremely solidly built and according to Chris a total joy to drive. 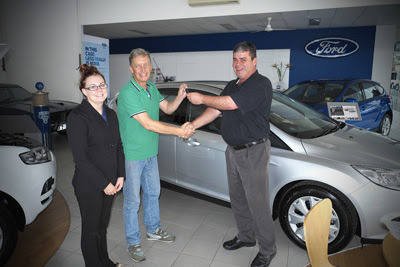 So, well done to Ford for a great looking well built little car and thanks again to the Action Auto Group people in Gympie for making our new car purchase an enjoyable exercise. e-Path is pleased to announce the availability of a customised payment gateway service, available for all existing and future payment gateway customers effective immediately. Residing securely within e-Path's PCI compliant and THAWTE SSL protected secure server environment, your exclusive gateway system can now resemble the look and feel of your own website. Unlike other payment gateway systems where you are forced to send your customers to one generic location/URL where everything is shared by everyone, with e-Path you have the tremendous security advantage of operating with your own exclusive, unique and secure gateway service/location. Your own secure URL to your own secure gateway which has been set up to handle only your own customers ... and nobody else! This one fundamental, which is another factor that further separates e-Path from all other payment gateways, means we can now allow you to design and develop your own payment gateway pages for your own customers. For many developers and website owners it is important to maintain branding and keep the look and feel of the source website through the payment process. This is now achievable. As you would expect there are some limitations due to security, for example, all content (graphics, images etc.) needs to reside within your own gateway on our secure server. If you would like to learn more about the new customisable payment gateway option, please contact e-Path. "Hey Dad, thanks but no thanks"
Now for something completely off topic and out of left field. What could possibly be better than having the opportunity to move into the family's rapidly growing business? We are talking about a business that is at the very forefront of a refreshing (and much needed) new era in e-commerce security and affordability. Well, for my son Brenton it's a "hey dad, thanks but no thanks". And he gets "busted" on "Rove in LA"
But that's not exactly all Brenton is up to. From time to time he'll be pestering the happy little Summer Bay community on Sydney's north shore as a badie "River Boy" named Stu in the popular Channel 7 series Home and Away. With that sort of competition the e-Path enterprise hasn't got a chance in a month of Sundays to attract him so what's a father to do? Well, the truth of the matter is I am bursting with pride at how things are starting to take shape for Brenton in his chosen career. [Update January, 2012]: With the fantastic experiences of SLiDE and Home and Away now behind him Brenton has managed to keep the momentum going. He has landed a support role in the new Australian film 'Save Your Legs'. 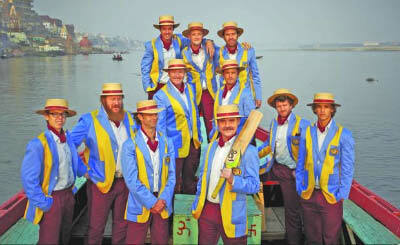 Described as a coming of middle-aged 'bromance' the film follows three long-time friends who try to play for Australia. [Update March, 2012]: Well, I have to say this latest one is fantastic for him. Brenton has landed the male lead role in the remake of the famous Blue Lagoon movie - the unforgettable original starred Christopher Atkins and Brooke Shields. [Update June, 2012]: Now that he has been rescued from a deserted island in "Blue Lagoon: The Awakening", there's no slowing his career momentum. He has landed an amazing role playing Prince Charming alongside Angelina Jolie and Elle Fanning in a new Disney production of Maleficent, that retells the story of "Sleeping Beauty". Brenton being interviewed about his role in Maleficent. [Update Nov, 2012]: Following on from filming Disney's Maleficent Brenton has landed a role in a horror film. 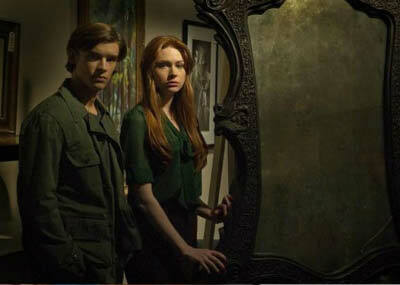 The film Oculus is about a woman trying to exonerate her brother (played by Brenton), who was convicted of murder, by proving that the crime was committed by a supernatural phenomenon. This one sees Brenton off to the US again. He loves it over there. We haven't seen much of him for well over a year now. [Update Christmas, 2012]: A few days break over Chrismtmas got us all back to basics. And no, his new found fame didn't get him out of cleaning his room!! Brenton, myself and Stacey bid a big hello from the sand dunes of Rainbow Beach the day after Chrissie. [Update January, 2013]: Breton is now off the W.A. to film "Son of A Gun" alongside Ewan McGregor. The film marks the debut feature of acclaimed short filmmaker Julius Avery and centres on the relationship between a master criminal (Ewan McGregor) and his young protégé (Thwaites). Breton tells me part of the prep for this film is being trained by experts in how to handle machine guns and hand guns. He never tells me much when he is filming (he is not allowed to) but by the sounds of things he is having an absolute ball. [Update March, 2013]: Brenton has landed another lead role in the film "The Signal". The Signal is a science fiction thriller film directed by William Eubank and co-written with Carlyle Eubank, David Frigerio and Sebastian Gutierrez. Brenton will be activing alongside Laurence Fishburne, Olivia Cooke and Lin Shaye. [Update June, 2013]: Brenton has landed a lead role in the film "The Giver", starring Jeff Bridges and Meryl Streep. Brenton plays a boy who is selected for his life service as the Receiver of Memories and works with The Giver (Jeff Bridges), an old man who teaches the boy to use his unique gifts of the senses. Meryl Streep will play the society’s Chief Elder, an authoritative and antagonistic woman who assigns the young their tasks. This one sees him off to South Africa. Amazing, just amazing! [Update: September 2013]: Well, this latest one really hits the spot as it involves his love of surfing. Brenton has been cast alongside Helen Hunt and Like Wilson in a movie called "Ride". Helen Hunt wrote the script, which sees Brenton playing a “NYU student who moves from New York to California for the summer. He leaves behind his strong-willed magazine editor mother (Hunt) and when she hears he is chucking school for surfing, she follows him. [Update: January 2014]: His latest film is called Gods Of Egypt and is being filmed at the Fox studios in Sydney. Brenton plays Bek, a young thief who joins the god Horus (Nikolaj Coster-Waldau) on a quest through the palaces and pyramids of ancient Egypt where they encounter the Sun god Ra (Geoffrey Rush) and the dark god Set (Gerard Butler), who killed and mutilated his brother Osiris. Horus, the son of Osiris, seeks revenge. Except for a brief time off at Christmas 2012, he has now been pretty well flat out for the last three years straight. The crazy thing is I think there will about four major films at the cinema at the same time and each with him in it. Anyway, great to see Gods Of Egypt being filmed in Australia. It also means he was able to take a well earned break before filming, so we slipped down for a surf at the 'secret spot' to recharge the batteries. And no, we didn't get bogged! [Update: August 2014]: We are in New York city for the premier of the movie "The Giver". 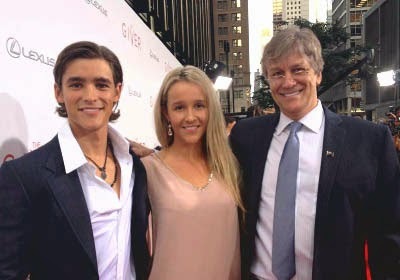 Brenton, Stacey and myself on the red carpet for the premier of "The Giver" in New York. It was excellent to be able to share in this event with Brent and somewhat surreal to find myself in conversation with some of the cream of Hollywood - Jeff Bridges, Meryl Streep, Katie Holmes, Harvey Weinstein, Phillip Noyce and more. The book "The Giver" by Lois Lowry is taught in U.S. schools and as you would expect there is enormous interest in the movie across all age groups over there. The release of the movie was top-billing news in the U.S. In Australia "The Giver" is to premier in early September in Brisbane and Sydney and as a favour to Brenton Village Roadshow *might* be also premiering it in Cairns, Brenton's home town and where we lived only up until recently. Son of a Gun movie released. An edge-of-your-seat heist thriller starring Ewan McGregor and Brenton. Son of a Gun tells the story of a young man who is drawn into the lawless world of a notorious criminal. This movie was filmed entirely in Western Australia and was an amazing experience for him in many ways. They filmed inside a real prison and he was trained to handle weapons. [Update November 2014]: It just goes from amazing to amazing for him. His next big project is a role in the latest Pirates of the Caribbean movie. As to what role he'll be playing is unknown (probably under wraps) but he is over the moon it is being filmed here in Australia. Go you good thing!! [Update March, 2017]: Pirates of the Caribbean: Dead Men Tell No Tales is all complete and is about to be released. Yes well ... I can kiss good-bye to any hopes of my son coming in to the e-Path business anytime soon, but hey, what an utterly amazing journey he is living right now. Let it roll on!! Amidst all these off-topic fun updates about my son Brenton I'd like also to make a quick mention of my daughter Stacey. Stacey graduated from James Cook University in Cairns achieving a Bachelor of Science and is currently assisting part time here at e-Path as well as assisting Brenton as his PA as she awaits employment in her chosen field - Environmental Science. One of the most caring, compassionate, obsessively accurate and self-driven persons you are ever likely to meet, Stacey is set to make a wonderful contribution towards making the world a better place. Yes, I'm beaming with equal pride for both my children. The recent spate of serious data breaches resulting in vast amounts of highly confidential credit card and identity data being compromised is again forcing a re-think about the practice of permanently storing highly confidential data, such as credit card and identity information, online in databases, in "secure" storage devices or on networks. If security defences was able to do the job of protecting then there would be no data breaches. If defences, security plug-in's, fraud alert systems and the like were all doing exactly as their sellers claim, there would be no data breaches and everyone's highly confidential data would be totally safe. But the uncomfortable truth of the matter is there will always remain an inherent risk to the security of any highly sensitive and confidential information, including credit card and identity data, when that data is taken and permanently stored electronically somewhere, especially online. These risks will vary of course. If the company handling or permanently storing your information within their systems is not PCI compliant then the risk is highly elevated, indeed, they should not even be touching credit card data without PCI compliance. If the company handling or permanently storing your credit card and/or identity data within their systems is PCI compliant then the risk is significantly reduced. It is important to note here that PCI compliance does not absolutely 100% guarantee the security of your highly sensitive credit card and identity data. Even the Payment Card Industry Security Standards Council (the governing body responsible for PCI compliance) themselves will confirm this. Your credit card data is amongst the most confidential personally identifiable data you own therefore you have a fundamental right under Australian Privacy Laws to determine what happens to it, who gets to store it online and who doesn't. Not only do you have these rights but it is also encumbered upon any organisation, person or identity handing this data of yours that they must inform you what is about to happen to your personally identifiable data, especially sensitive credit card data. Let ma ask you this question, the last time you paid by credit card online using an automated online credit card payment processing system were you told they will be permanently storing your credit card data within their systems and that it is unlikely you will be able to have it deleted? I'm not talking about being the recipient of "sales" talk about how safe they believe their systems are, "super encryption", "one way hash", "secure vault" etc, I'm talking about the cold hard fact that your credit card data is being taken from you online, permanently stored somewhere within their systems without you being able to have it removed. Much of the world is currently at war against many forms of "cyber-hacking" or "cyber-crime" activity that targets sensitive information including credit card and identity details. I believe the time is now to start exercising some control over what of your highly sensitive information you will allow to be taken from you and permanently stored online, especially credit card and identity data. That control can simply mean deciding not to allow your highly confidential information or data to be permanently stored online. If your sensitive data doesn't exist online or in any storage device or system then no matter how good the "cyber-hacker" your sensitive data is simply not there to be stolen. It is the absolute ultimate online protection for your confidential information, not just credit card and identity data. e-Path is the first credit card payment gateway designed from the ground up to put the security of cardholder data first for a change. We enable credit card payment authorisations from the internet where credit card and identity data is NEVER permanently stored anywhere within our systems online. If you are an online business then by offering your customers the opportunity to pay online via a payment gateway that will not be permanently storing credit card and identity data within its systems, such as e-Path, you will be offering your online customers a supreme level of security. At the risk of repeating myself, the fact is the overwhelming majority of credit card and identity data theft in the world today does not need to happen, you just need to choose the right payment gateway! As any astute online business owner will tell you, good control is a basic fundamental of good management. Nobody would think to operate a business without having at the least a decent level of control over it. Yet, when you accept credit cards online via the current real time online credit card payment processing system set up to handle things automatically you hand over one of the most critical of decision making responsibilities to systems beyond your control. When accepting credit card payments 'live' online your third party payment gateway processor in association with your merchant account system will, in effect, make the decision as to what orders and credit cards your business accepts and charges. You can be fast asleep then wake up to find your business has already accepted 20 payments for items or services without even you knowing. This is what live processing of credit cards online is all about - blindly attempting to transact credit card payments entered by anywhere and from anywhere on the open internet. While automation may be a wonderful thing to some businesses the fact is you are completely blind to the process and are at the mercy of systems not under your control. But what happens when their systems fail and it processes a credit card payment that later turns out to be fraudulent? What happens when all the much touted (and costly) extra terrific "fraud screening plug-in's" or fantastic "fraud alert system" add-on's fail? Do they take financial responsibility for their own system's failure? No. It's your fault. You are the one to wear the loss! Absolutely outrageous, that's what I say. You only have to look at the growing 'card-not-present' credit card fraud statistics to learn this is becoming an increasingly dangerous likelihood for many online business owners. In fact, near all of the online credit card fraud in the world today is perpetrated via the real time live online credit card processing method. For those within the online payment processing industry this is of course perfectly normal practice. Indeed, some may even think it down right troublesome of me to be bringing this strange anomaly to light, after all, this is the way its always been, this is how its done to this very day and this is exactly how the powerful online credit card processing industry plans on keeping it. Well, despite it not winning me any friends within the industry, I'm here to tell you that's not the way it has to be any longer. Times are changing and people are starting to make decisions to protect themselves and their online businesses. No longer do you and your business need to be exposed to this absurd risk. The e-Path manual credit card payment gateway puts an immediate end to the potentially devastating 'Russian roulette' nature of accepting credit cards online where you as the business owner have no control over what credit card payments your own business accepts. With e-Path it is the bank approved merchant faculty owner who will safely charge the card offline, well away from the risks of the open internet, should they choose to accept the order in the first place. The business owner is in control of their business. The online business owner of course still needs to be vigilant because they are receiving card not present payments but with e-Path you have the opportunity to check highly pertinent information about the buyer first BEFORE any harm is done - something you can not do when set up to accept and transact credit cards live and automatically online with the much more expensive real time online payment processing method. So not only is e-Path a less expensive and more secure system but e-Path is also ideal for those who want to accept credit cards online but don't want online orders and payments to be automatically accepted and charged blindly on the open internet without them knowing. Seize back control of what orders and payments are accepted online and save a considerable amount of money along the way. Is CDU Compliance the future of ecommerce? At the end of today's rambling you will have a clear understanding of exactly how the vast majority of the world's credit card fraud can be terminated. Not quite the same as disclosing the cure for cancer but considering highly sensitive credit card and identity data theft and credit card fraud are all considered the electronic cancers of our day and age, then perhaps pretty close. It is called CDU (Critical Data Unlpugged). Have a read of that section and you'll end up with the knowledge that has either completely eluded the mega-billion dollar online payment processing industry or perhaps is being quietly ignored by choice. But first let me make the important point that CDU (Critical Data Unplugged) is not an official data security standard. It is not enforceable by any established authority. CDU (Critical Data Unplugged) is a genuine local initiative to term the absolute fool-proof security practice of terminating the core root reason why the vast majority of critically sensitive and private information becomes available to be compromised in the first instance. It's all about promoting the complete removal of all critically sensitive and highly confidential data from being permanently stored online, in any database, network, storage device or internet connected system. When data doesn't exist it can't possibly be stolen. The force behind the new CDU initiative originated directly from Police and law enforcement authority advice to the general public and business communities on how to guarantee total and absolute protection for all forms of critically sensitive information in the internet connected world, not just credit card and identity data. Police and law enforcement authorities don't mess around. Keeping people safe and secure is their purpose, they are not motivated or influenced by what makes money or what doesn't make money. By far the real issue is internet borne theft of sensitive data and fraud perpetrated on the internet. The overwhelming majority of the world's stolen credit card and identity data can be traced back to that data being compromised (hacked, copied, stolen etc.) when permanently stored online, within payment processing systems, on e-commerce websites, from networks, from storage devices or from internet connected systems. Real time credit card payment processors have the unenviable reputation of being "where it's at" for hackers, cyber criminals and online criminal gang syndicates intent on stealing big numbers of credit card details. And with the possibility of huge numbers of highly sensitive credit card details permanently stored within their systems, its like a red flag to a bull, the perfect made to measure pot of gold target for online criminals. 1. When data doesn't exist it can't possibly be stolen or compromised. 2. Without any credit card or identity data being stolen or compromised then credit card fraud would dry up to a trickle. The understanding of those indisputable and fundamental facts and the bold preparedness to implement ground-breaking practices, policies and processes based on them has the potential to turn dreams of a world without credit card fraud into an absolute distinct possibility. This is what CDU (Critical Data Unplugged) is all about. We live in a world of electronic devices, where internet systems, networks and online storage appliances are very much a part of how the business world operates. For many businesses it would simply not be possible to operate effectively if they no longer stored sensitive information within their systems. However, this is absolutely no excuse to throw in the towel on efforts to end credit card and identity data theft and to halt online credit card fraud. CDU security practices are being adopted, by choice, by people and many businesses courageous enough to move away from permanently storing sensitive data on internet connected systems, storage devices and networks in order to afford themselves and their customers with by far the most effective data protection ever proposed in this age of the internet. e-Path is one such company. To learn how e-Path came about, see: About e-Path Pty Ltd.
You can't thieve something that doesn't exist. And there rests the key to a future without credit card fraud. A new era in e-commerce security and affordability is here. e-Path is a low cost method to safely and easily accept online credit card payments from your website or shopping cart without any on-going payment gateway transaction fees or charges.